Longe to the left: walk, trot, canter. Longe to the right: walk, trot, canter. Bored yet? Chances are, if you are tired of this common routine, so is your horse. In horse training, as in cuisine, travel and conversation, variety is the spice of life. This does not diminish the benefits of some forms of routine. Horses enjoy routine around feeding times, turnout and owner visits. And longing is an effective tool to assess or improve your horse’s condition, and to help to burn off excess energy before riding. However, there can be two extremes: either being tuned out (I recently witnessed someone longing his horse while he was talking on his cell phone) or agenda-based (longing before riding, but reacting negatively if the horse does not perform as expected in the prescribed time frame). 1. To foster an equal relationship with the horse based on trust and respect; something that each of you must learn from one another. 2. Never to adopt “standard” or inflexible methods of training and communication; you must recognize that each horse develops in his or her own way. 3. As a trainer, you are their partner. It is your job to reduce stress, as well as to become a safe, trusted “haven” for the horse. 4. Always to be patient with a horse; never push them too fast or too insistently. By varying the horses’ routine, you prevent them from getting bored or becoming unresponsive. 5. 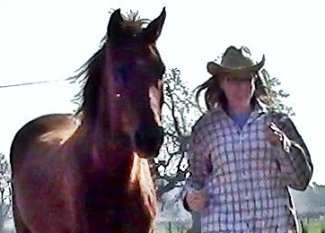 Never to use force or become angry; horses aren’t meant to be dominated or broken. 6. Work hard to establish more “natural” forms of communication; if you listen, your horse will tell you how to speak with him in subtle, almost invisible ways. JoAnna Mendl Shaw, Director of The Equus Projects (http://www.equus-onsite.org), has been creating performance works with dancers and horses since 1999. She has found that “especially for horses that like to think, repetition becomes boring. The drilling becomes drudgery, and the horses become bored if tasks are done in the same order all the time.” She has witnessed a horse memorizing the choreographic sequence and skipping to the end, and that too much repetitive rehearsal leads to the anticipation of cues. Mixing things up keeps both the horse and the dancer engaged and curious, and can also lead to improvisation and a deeper connection in a performance. Recently, my Morgan Cross Tango became arena sour and no amount of prompting or waving of the longe whip would get him truly involved with my requests. He would stand stock-still, telling me, “Is this fun for you? Because I don’t know why we are doing it.” This caused me to be introspective about my methods; why was I asking him to longe? He had already joined up with me and would follow me off-lead. He was living in pasture, so had plenty of room to move and did not need to burn off excess energy before riding. I was just following a regular routine practiced by many. 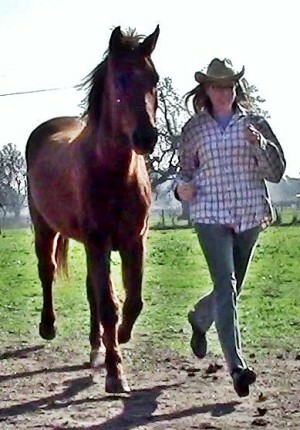 So instead of training in the arena, we went to the pasture and I started running freely. I did this every day for weeks. Sometimes he would walk over to where I had stopped to catch my breath, and sometimes he would just eat grass. Once in a while, he would jog for a few paces. And then one day, he came along for the run. And we have been running together ever since. This was fun, for the both of us. Now it was time to test if this had just been an anomaly, or if this had truly been training. When you approach training with a fresh perspective and a revised set of expectations, you will be amazed at the differences you will see in your horse. It is never too late to create a new starting point.